A disturbing trend that has recently come to light is the occurrence of elder abuse in assisted living facilities, nursing homes, and even live-in and part-time care in Rhode Island from hired caregivers. 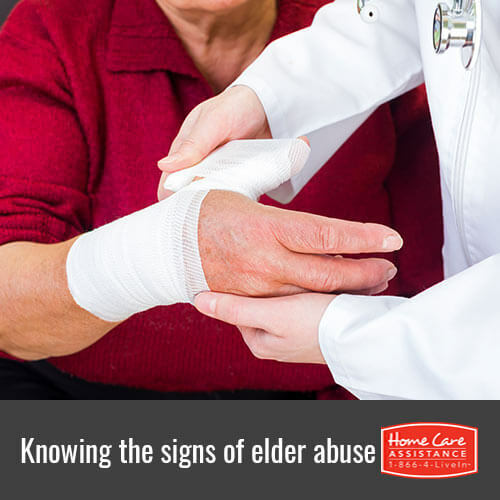 Family caregivers should be aware of the warning signs of elder abuse, such as the examples listed below, in order to help protect their senior loved ones. Injuries, even those that don’t seem serious, should not be a normal occurrence. If your senior loved one has inexplicable injuries or bruises, especially in multiple places on both sides of the body, it’s important to investigate the situation thoroughly. Speak with your loved one as well as the staff to see if the stories match. Be especially wary of injuries that the caregiver doesn’t seem to have an explanation for or brushes off. Watch your loved one interact with his or her caregivers. If there is tension, anger, or wariness between the senior and his or her caregiver, especially if these feelings persist over a period of time or are extremely strong toward one caregiver, it’s time to investigate the reason behind it. Look out for employees who try to push these temperament changes off on the effects of aging or dementia. If your loved one hasn’t been diagnosed with dementia by a doctor and doesn’t receive Rhode Island dementia home care, there’s a strong chance your loved one isn’t comfortable with his or her caregiver. Ask your loved one about whether or not his or her care needs are being met. Inquire whether someone responds to your loved one’s requests in a courteous and timely manner or if the requests go ignored. Find out if your loved one is regularly receiving baths, clean clothes, has fresh water, eats nutritious meals, and receives proper doses of necessary medications. While facilities may be understaffed, your loved one’s needs still need to be met on a routine basis. Otherwise, it’s possible he or she is being subjected to elder abuse. Seniors deserve to age gracefully in the comfort of home without the fear of being subjected to elder abuse. If you’re looking for a dedicated provider of home care Rhode Island seniors can trust, look no further than Home Care Assistance. We ensure seniors receive compassionate home care from trusted caregivers in a safe environment, whether they require assistance with housekeeping and personal care or medication reminders and companionship. Learn more about our services when you call us today at (401) 284-0979 to schedule a free in-home consultation with an experienced Care Manager.